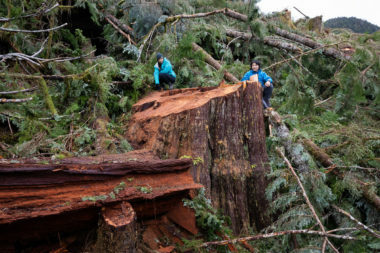 New logging has commenced on Edinburgh Mountain, an exceptional old-growth forest “hotspot” near Port Renfrew in Pacheedaht territory on Vancouver Island and the location of Big Lonely Doug (Canada’s second largest Douglas-fir tree) and the spectacular Eden Grove. 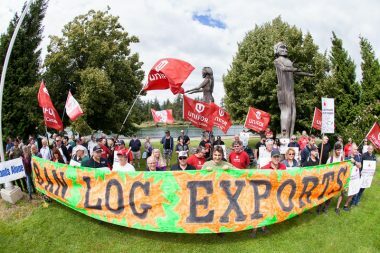 On Friday, July 22, forestry workers from various sawmills and pulpmills from two major unions, the PPWC (Pulp, Paper, and Woodworkers of Canada) and Unifor, were joined by community members, politicians,first nations, and environmentalists in Port Alberni in a rally for sustainable forest policy in BC. 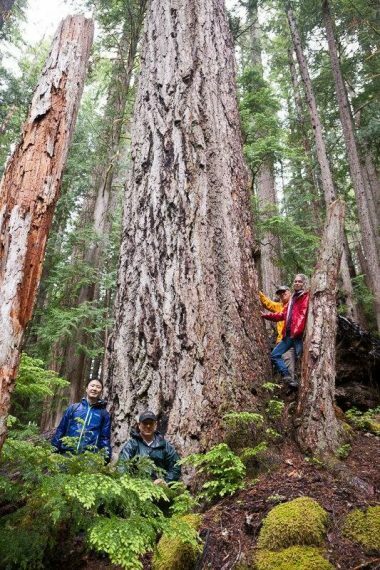 Last week Vancouver Sun's columnist Stephen Hume came with us to see the endangered Cameron Valley Ancient Forest (ie. "Firebreak"), a truly spectacular lowland stand of densely-packed, monumental old-growth Douglas-firs akin to a "second Cathedral Grove". This grove stands out as among the finest remaining old-growth Douglas-firs anywhere left on the planet and is of international conservation significance. For the second time this month, volunteers have worked with the Ancient Forest Alliance to construct boardwalk at the Avatar Grove. This round was a huge success! Together we completed 50+ feet of new walkways over many of the areas that flood in winter time and added a beautiful staircase leading off the road to our new viewing platform in the Lower Grove. Volunteers also worked hard to add mesh traction to the many steps, cut and carried over 100 planks of wood into the bush, mixed cement and moved heavy rocks, and did it all with a great attitude and smiles. Thank you all so much!! We're making tremendous progress thanks to the help of the many dedicated individuals who've come out and the donations made by AFA supporters and local businesses. We're working to finish the boardwalk this summer, hopefully after 1 or 2 more work parties. The boardwalk is necessary to help protect the area's ecological integrity and improve visitor access and safety. Stay tuned for further info if you'd like to help out, contact boardwalk coordinator TJ Watt: tj@ancientforestalliance.org Trail building or construction experience is an asset (we can use more of you!) but not required. 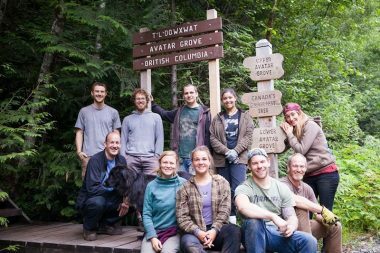 Over the May long weekend, a group of core boardwalk volunteers got together to complete a beautiful new entrance to the Lower Avatar Grove. 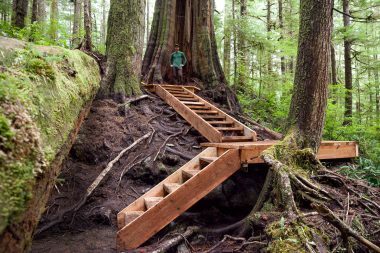 This included a 10ft wide viewing platform with an incredible view overlooking the old-growth forest as well as a safe and long-lasting set of stairs leading off the road. 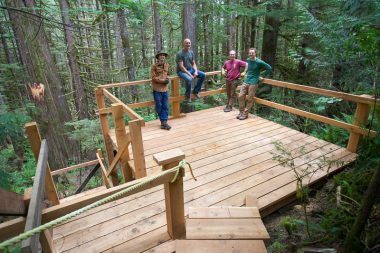 Support the Ancient Forest Alliance boardwalk as we close in on the home stretch this summer! New Photo Gallery: Climbing Big Lonely Doug – Round 2! 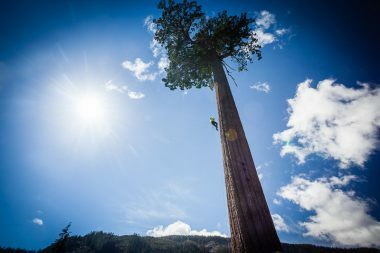 The Ancient Forest Alliance has once again teamed up with members of the Arboreal Collective to ascend Big Lonely Doug, Canada’s second largest Douglas-fir tree near Port Renfrew! A big show of gratitude and thanks to the over 20 volunteers who came out to build boardwalk at Avatar Grove last weekend and to the many of you who have donated towards this project so far! We made significant progress in the lower grove, constructing close to 80ft (25 m) of new boardwalk and bridges over the area prone to flooding. These vital improvements come just in time before the heavy winter rains begin. There’s still a few key sets of stairs and bridges to get built but we’re making great headway on what has become one of the island’s most popular hiking trails! New Photo Gallery and Time-Lapse of Avatar Grove Boardwalk Construction! 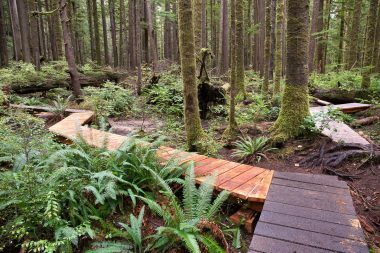 Over the September long weekend, AFA’s TJ Watt and a small group of dedicated volunteers worked hard to construct a crucial new section of the boardwalk at Avatar Grove. n the Upper Grove, the steep slope leading down to the creek had become quite rough and slippery, so to help protect the tree roots and make it safer for everyone visiting, the group built two new platforms and sets of stairs leading down the hill. They also installed a beautiful new bench by the Gnarly Tree!